West country brewer, Bath Ales, has extended its sponsorship of Bath Rugby, with over 52,000 pints of their flagship amber ale being sold at the Recreation Ground in the past 12 months. 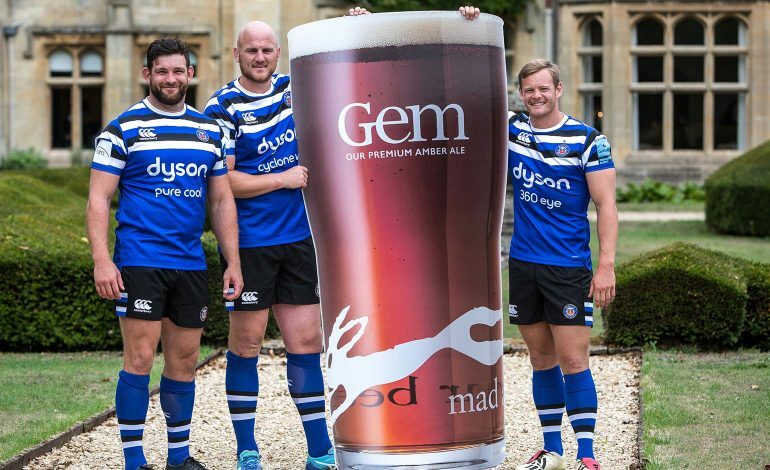 Bath Ales’ flagship amber ale, Gem, will continue as the official beer of Bath Rugby – served on cask from the start of the season. For the first time Bath Ales’ new English lager, Sulis, will also be available across all bars at The Rec. Brewed in honour of Sulis Minerva, the Roman goddess of Bath, Lemon Drop and Hüll Melon hops, give the lager a bright freshness and a subtle hint of fruitiness. As part of the partnership, Bath Ales branding will feature around the Rec and on the team’s playing shorts. The West Stand will also continue to be known as the Gem Stand, as it has since it was officially renamed in 2016. Vicky Guy, brand activation manager, Bath Ales, said: “We’ve really enjoyed working with Bath Rugby for the past four years. There’s such a natural fit between both businesses – and the fans and our customers. Ben Wells, Chief Commercial Officer, Bath Rugby, added: “We have established a very successful partnership with Bath Ales over the years, and are delighted to have extended the agreement further. Bath Ales was acquired by brewery and pub operator St Austell Brewery in 2016 and opened the doors of its new state-of-the-art brewhouse, Hare Brewery, in May 2018. Tarquin McDonald, Bath Rugby’s managing director officially opened the new brewery.